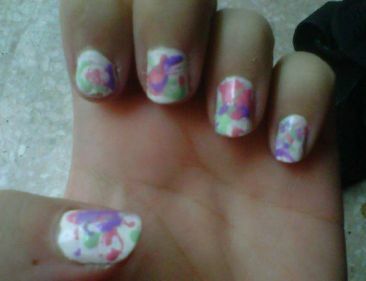 This is my third attempt at a splatter mani, and it gets easier each time I try it. It’s done using the same concept as the arts and crafts project where you dip a small straw in paint and blow on the opposite end, while aiming it at your canvas (paper or nail). Make sure you apply tape around your nails, and do this on top of a piece of newspaper to make for an easy clean-up. Pure Ice (981CP) “Super Star!”. Pink – Pure Ice (917CP) “Love”.